Did you say “Hananiah, Mishael, and Azariah”? Hmpf. I’ll bet you called them by the Babylonian names they were given by their captors (Daniel 1:7) – didn’t you? Imagine this: suppose we were invaded by an evil people from the east – the Cheeseheads. They took over and gave us all new names from their Cheesehead culture – names like Bucky, or Suds, or Lambo. How would you feel about being called by those names? Unfortunately in life, we all get called names we don’t like at some point or another. Sometimes these names even stick – whether we like it or not. And sometimes we call ourselves bad names in our heads; even though others don’t hear us, the names are just as damaging, if not worse. Ephesians chapters 1 and 2 give us an extended list of who we are in Christ. Are you buckled in? Listen to this – Paul says that if your name is “Christian” then you are: blessed in Christ, chosen in Christ, holy, blameless, loved, predestined, adopted, blessed with grace, redeemed, forgiven, part of God’s will, purpose, & plan, united, given an inheritance, hopeful, sealed with the promised Holy Spirit, faithful, appreciated, remembered, prayed for, enlightened, called, shown mercy, loved, alive with Christ, given grace, saved, raised up with Christ, seated with Christ, shown kindness, given a gift from God, His workmanship, created for good works, brought near to God, at peace, one with Christ, reconciled to God, given access to the Father, no longer strangers & aliens, fellow citizens with the saints, members of the household of God, and being built together into a dwelling place for God by the Spirit. WOW! Isn’t that an AMAZING list??? I’m pleased just to make your acquaintance! 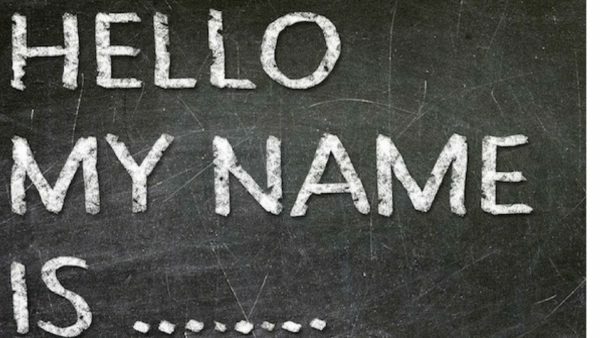 If you hurt over a name the world calls you – or of a name that little voice in your head keeps repeating – I hope you will regularly remind yourself and others of who you are in Christ. Don’t ever forget: He went to the cross to give you that right.